We’ve all been there, big conference we are SO excited for. We get everything ready to go, the paperwork to take the days off, asking for a sub, picking the right workshops. It all boggles the mind with how much work needs to be done for some fun but we all know it is totally worth it in the end. I thought it would be cool to list some must have apps that can help you keep organized and not only give you the opportunity to have a lot of fun but also learn a lot as well. Some of these are my recommendations, and some were polled from my Twitter PLN! Tripit– A complete must have for any avid traveler. It organizes all of your travel so you can have all your flight, hotel, and anything else you need in one place. This app has a fantastic feature that allows you to forward all of your confirmation emails to them and it automatically gets put into the app for you! Evernote– Ultimate note organization app. You can take photos of presentation slides, take voice memos, or just type the important points and keep them all in one place. This app also automatically syncs with whatever devices you have the app downloaded to. I can take notes on my iPad and have them automatically sync to my computer. Guidebook– Many conferences are starting to go mobile with their conference guide books. Check out this app and see if your upcoming conference is on it. You can see all of the sessions for the conference, make your own schedule, get alerts, and make a list of all the exhibitors you want to see. 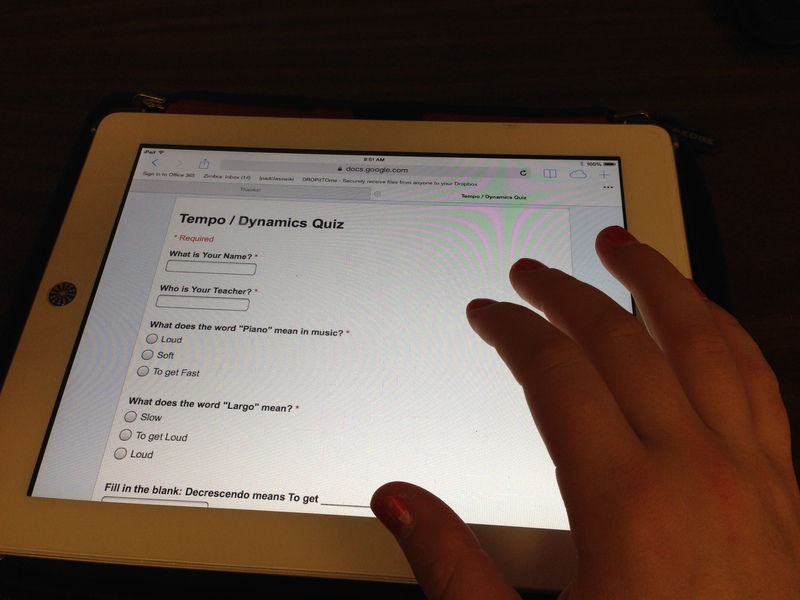 Notability– A fantastic note taker app. 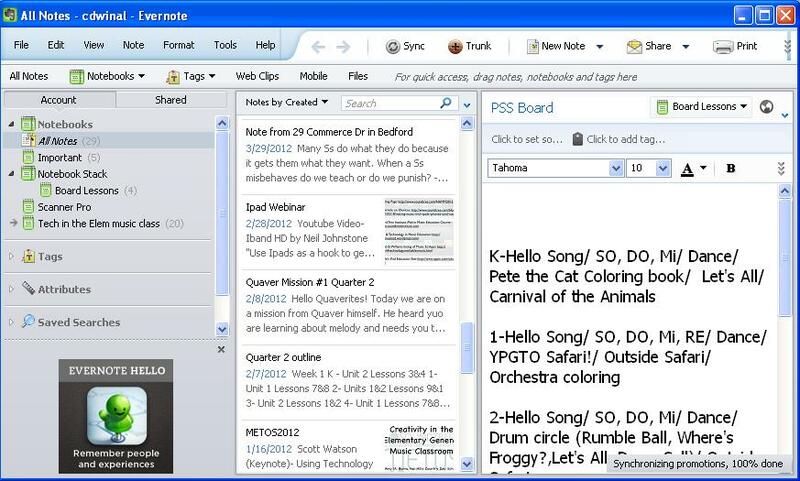 Recommended by many, this app takes the place of a pencil and notebook and allows you organize your notes all into one place. Twitter– Twitter is becoming the ultimate tool in collaboration and connection especially at conferences. Find out if the conference you’re attending has a hashtag. You can talk to other attendees and maybe even meet up and make new friends. QR Code Reader and Scanner– It is popular for many presenters to put QR codes into their presentation for you to be able to download extras or go to the link they are talking about. Having a good QR code reader will always come in handy for grabbing those extras. Some conferences use QR codes to make the conference more interactive by having QR hunts where you can win prizes! PDF Expert– Because who doesn’t need a really nice PDF organizer and reader? What’s your favorite app to use at a conference that you can’t live without? Man this has been an awfully long and rough week. You can tell there are only a few more weeks left of school! 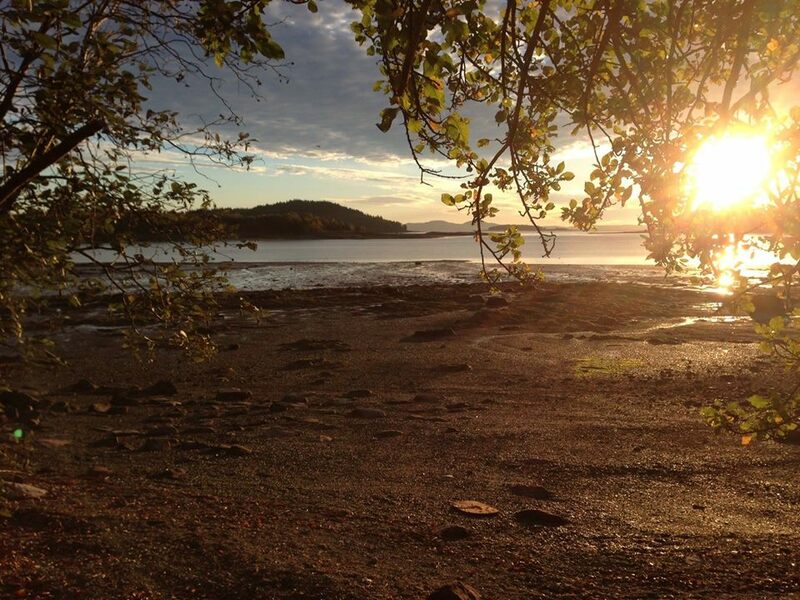 I’m heading north of the border this weekend and disappearing up into Canada for a few days to celebrate the long weekend ahead so I thought I would do a quick post about some social media tips for newbies. I love seeing a new teacher join on Twitter. The excitement knowing a whole new world of information and collaboration has opened up to them. It is amazing what you can do with a few new connections. For those who just start, some struggle with finding new people to collaborate with, that is when hashtags can be a big aide. Joining in on a Twitter chat creates new friendships and co-workers you could not normally get but just tweeting out. #Musedchat- Monday nights at 8pm est, Moderator is @jguarr. Join in and talk with other music educators about life in the music room. #edchat- Tuesday nights around 7pm est, Moderators are Tom Whitby, Steven Anderson, and ShellTerrell. Talk with other educators about various teaching techniques. #Quavermusicchat- There is no chat for this (there should be.. hint hint) but this is a fairly new hashtag for the growing community of dedicated Quaver Music Teachers. #musedmot- Once a year dedicated music teachers get together on one day and use this glorious hashtag to talk shop for hours at a time. It is run by your truly. There will be a biweekly chat with this tag starting in June! If you would like to learn more please visit www.musedmot.webs.com. Think you’re ready? Check out this list of music educators to follow on Twitter and get started! http://mustech.net/projects/musictwitter/ My twitter handles are @musiccargirl14 and @musedmot. Let me say first, I am jealous of those who are telling me you only have a few more days left of school. I have 4 weeks left starting next week and am trying to think about how to end the year with a bang. For most of you that means crazy kids, fun filled days with lots of programs, concerts, and assemblies, and the terrible horrible spring fever..dun dun DUUUNNNN. I decided to post some things I have done in the past to help combat the end of the year blues! Floor Drumming– All you need is a bunch of rhythm sticks and a few popular tunes to be able to do this. I have a playlist of Kidz Bop songs that I use and just press play after I pass out sticks. I teach the students a couple of different ways to play before we get started and then just tell them to keep the beat any way they want on the floor and sing along. The kids get a complete kick out of it and its a great way to beat out some end of the year frustration. Recycled Instruments– I’m actually doing this with a class of 3rd graders right now. I collected scrap paper, cardboard, rubber bands, tape, paper clips anything I could find and dumped it on the floor after we talked about string and percussion instruments and told them to go for it. After they are done making their instrument they can color and decorate before we get together and just play. This is a great way to get rid of unwanted or unused office supplies! Communal Drumming– I use to be very much into learning about communal drumming activities and still do some with my kids. My two favorite to play are from the Facilitator series by Kalani. One is called Rumble Ball and the other is a hot/cold game where students need to play faster when the seeker is closer to the object and slower when they are further away. Drum Circle– I have a full set of kids percussion instruments, I have each student pick one (Or I pick for them.) We then carry them outside and we start by doing a couple warmups and playing rhythms together before dividing it up by instrument and start a jam session with each instrument playing their own ostinatos! Found Objects Performance– Give them 20 minutes and a whole area to find something they can play as an instrument and bring it back to the circle before time is up. After, treat it like a drum circle and get playing. Chalk Notation– I have a bucket of sidewalk chalk and permission from my principal and we go out and take up the black top on the playground and write measures of 4 beats. They then grab a partner and clap it together before adding more or going to the next free space and making another one. By the end of class the whole blacktop is filled with music! Bean Bag Throw Composing– I had my Dad help me with this one. I bought him two large pieces of Plywood and he cut out 5 bean bag sized holes in each. I then painted a note or rest near each one. I put the kids into teams and give them a piece of staff paper for each team and a set of bean bags. They take turns throwing and must fill 4 measures of 4 beats each to win. If they get it a note that won’t fit then they must keep trying until they do! In order to win the whole team must say or clap their rhythms after they are done. 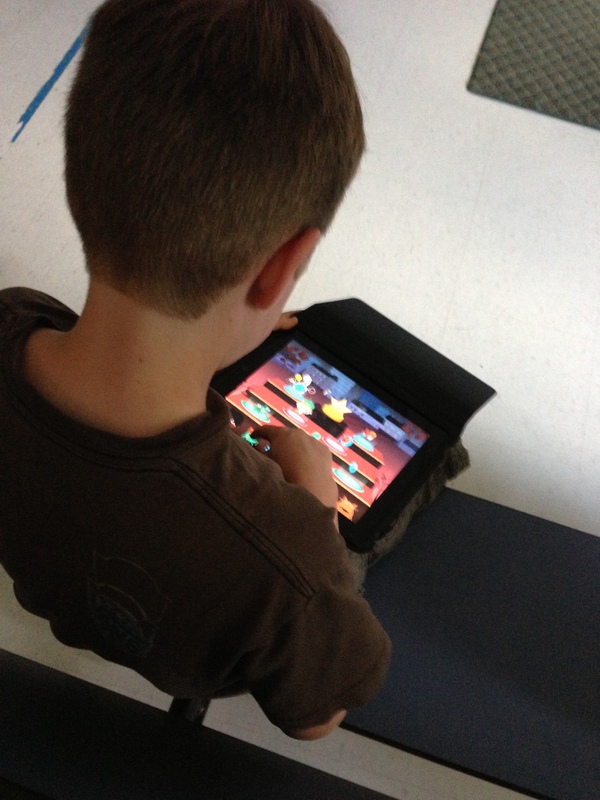 Outdoor iPad Band– I love this, we have a set of iPads I can rent out for the day. Each one has the Garageband app on it. I have kids each take one or partner up on them and choose on of the smart instruments in the app. We then come up with ostinatos each instrument can play. Then it turns into a giant jam session. I sometimes record it and they listen to it after to hear how great they sound! I’ve met many Quaver teachers over the past few years. We’ve talked a lot about the program and how awesome a tool it is. From the interactive whiteboard activities to the episodes and more. Quaver is a swiss army knife for music educators. its got everything you need in one package. The one thing that has come up though is the assessments. 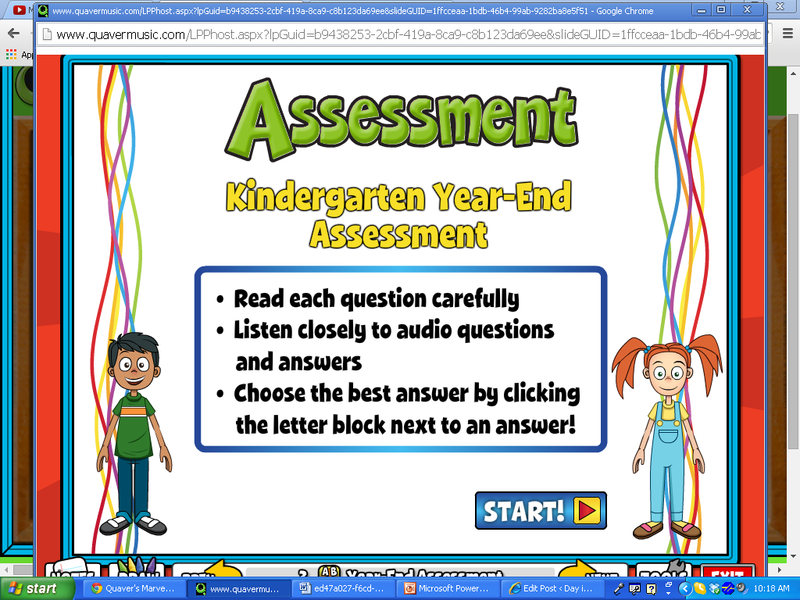 People get concerned about what Quaver has labeled as assessments because they are just bubble sheet answer quizzes and start to believe it is a plug and play sort of curriculum needing no prior music educator know how. My defense to this is only a trained music educator can use this program, why? because they know how to teach it properly, they know how to sing it, they know how to direct the activities and organize it in a manner that would be beneficial to their specific classroom. They also know how to assess it, the assessments in the curriculum are decent but they are not all I use and should not be the only thing educators use with this curriculum. I observe, I ask questions, I have students build products, it’s all a part of how a music classroom runs. This week I’m going to give a suggestion on how to get creative with assessing your students using the curriculum. Find out the overall learning objectives for the year. 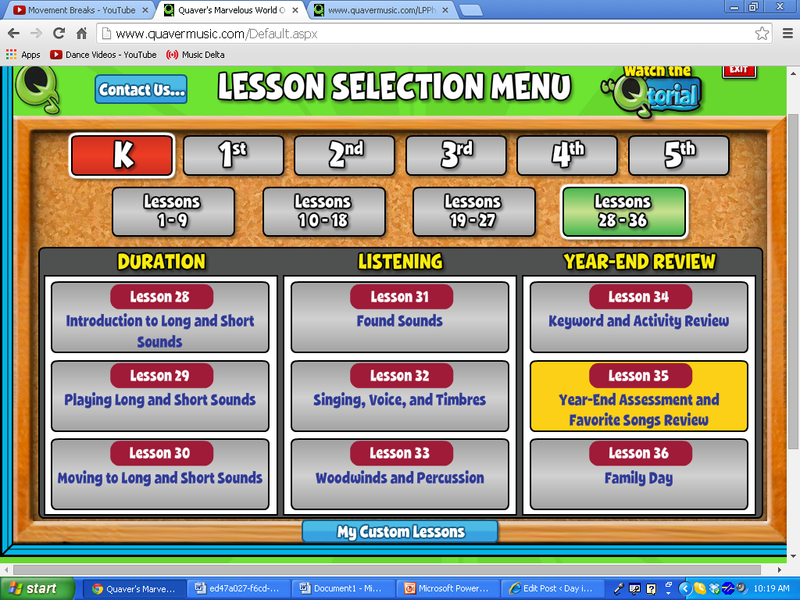 If you go solely by the Quaver Music curriculum check out lesson 35 at the end of each grade level. The end of the year assessment in that lesson is a great snap shot at what the students should know by the end of the year. Write down the most important learning objectives. Take the top 5 or 6 from those learning objectives to focus on for your artifacts. Video tape student performing song to assess rhythm, movement, etc. Audio record students (individually or group) to assess pitch matching, 2 part singing, solfedge. If there is a worksheet for the lesson, have the students complete it. You can scan in the work after to put in the portfolios. Work for projects in the curriculum such as the 4th grade Rap unit or the 5th grade Commercial project can be put into the portfolio. Portfolios show growth, they take the focus away from teaching to a bubble test and show students are actually getting it (lets face it, I have students who get it but cannot demonstrate on a written quiz or test. 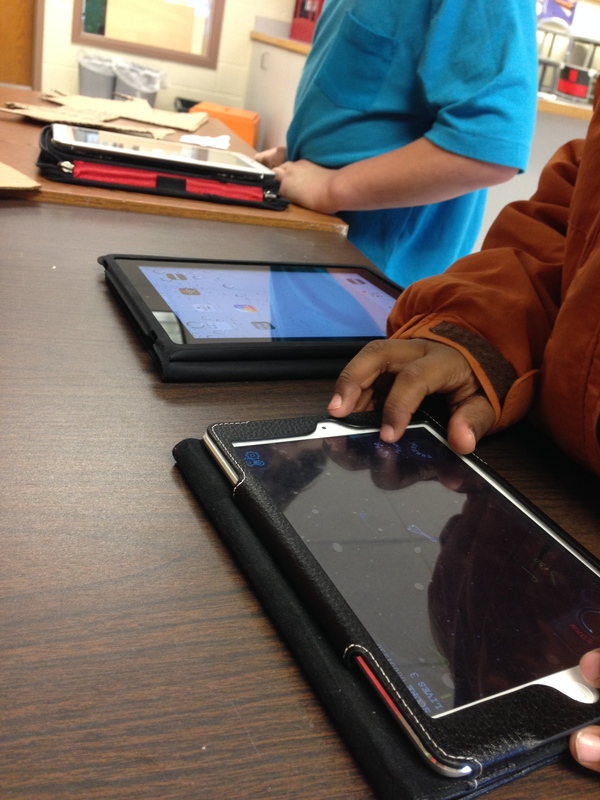 Portfolios are another option for those kids). 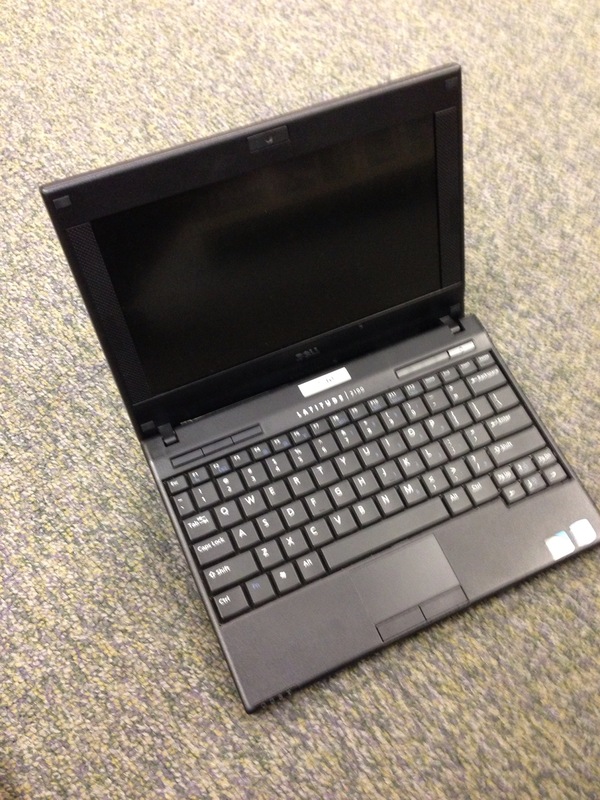 If you have the QK-5 there are more ways than one to prove your students are learning. It just takes a smart and creative music educator to do it. Hey! Are you on Twitter? I want to start a new hashtag meant just for awesome Quaver Teachers. Start using the hashtag #Quavermusicchat and let’s get connected! YES! It’s Friday. Do you know how wonderful the word Friday is?? As Winter turns into Spring my want to be cuddled in a cocoon of blankets turns into a need to get up and GO. Don’t care where and don’t care for what I just want to go. I call it wanderlust, some people may call it Caged Animal Syndrome, and others..well it’s just Spring Fever. The week has really been a blur except for a few awesome teaching moments here and there. One that has stood out is how fast my 4th graders are catching on to recorder! I’ve been using the Music K-8 Recorder Karate method for the past few years. I find the program effective and instead of individual belts for each 4th grader, I actually have each class earn belts as a whole. It holds everyone accountable and creates a positive and competitive learning environment where everyone is included because they compete for their belts against other classes. I put their belt boards up on the wall so each class can see where the other classes are. My problem with recorder is with my schedule. I switch between two schools every marking period which makes learning recorder very hard if I was to divide it between quarters. So I have to cram in a whole year of recorder into 9 weeks. I have trouble keeping the kids on track if they go at such a fast speed earning belts. With the addition of the Quaver curriculum and sometimes just using ClassPlay, I came up with my own belt system (That REALLY works!) which students learn at a good pace, earn belts to keep them interested, and slowly build up the needed skills to play recorder. I added in some new belts to extend the learning. It is a mixed list between Quaver Recorder ClassPlay Songs and Music K-8 music. White- Walk Like a Mummy/AAA/Glue Blues Each Quaver song builds the skill of each of the beginning three notes of B, A, and G. The class must play all three songs correctly to earn their first belt. Yellow- Hot Cross Buns/ Gently Sleep Expanding on the first three notes of B,A,and G both of these songs put it all together and we use Hot Cross Buns from Quaver and Gently Sleep from Music K-8. Both songs must be completed before moving on. Sheep- Perry the Sheep A Fun Quaver tune that gets the students singing and playing, it helps with getting ready to play a song quickly and songs with measures of rest in between. Green- Recorder Shuffle A Quaver tune.Jumping up the tempo and adding 16th with our B,A,and G songs. Purple- Miss Mary Mack Now we add the High C! Quaver is awesome. Weather- It’s Raining Music K-8 helps my students discover the lower register of their recorders with a low E.
Brown- Old MacDonald Going on with Music K-8 This song adds another note of E to the lower register and we focus on articulation using the third line which stays on the same note. Black- Ode to Joy Because what can you change about the legendary Music K-8 Black belt? NOTHING that’s what. Gamer- Level Up Quaver Style DUETS! Great introduction to chords as we play like we are in Wreck it Ralph. Bagpiper- Amazing Grace A traditional Music K-8 tune. The only reason I leave this for last is because I bring in my bagpipes sometimes and play along. The most important part about this plan is that the student not only have stayed interested in the program and WANT and are EXCITED to come play in music is that I have been able to slow down the pace, give them time to practice, and have improved their skills times a million percent. When I was just doing the Music K-8 Recorder Karate I would have to write in notes and say notes. I haven’t had to do anything like that this year. The students are tracking, and reading all on their own with only a few students needing extra support. I had one class this week play through Merrily We Roll Along without my help and by themselves together as a group. I was getting ready to teach it to them and found out I didn’t need to. Let’s just say they earned their Orange belt pretty quickly! 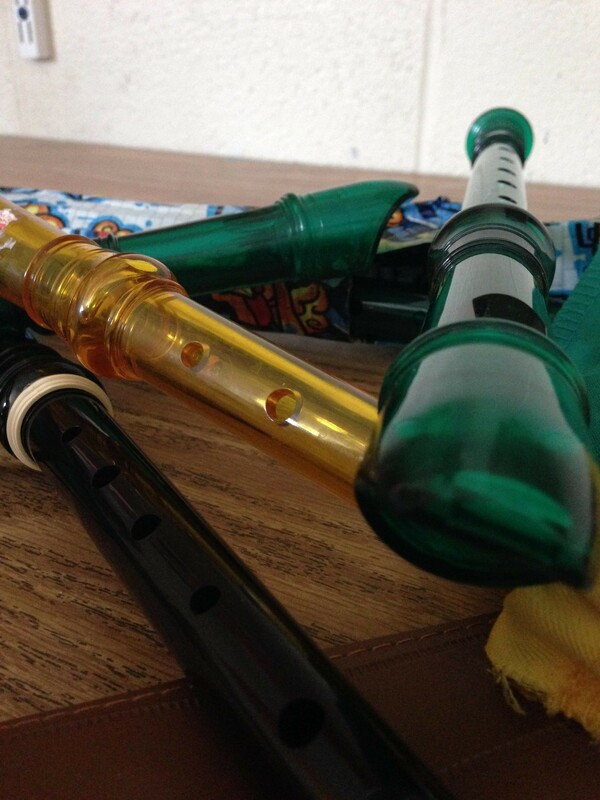 Do you do Recorder Karate or Quaver Recorder in your classes? How do you teach it? In what ways do you make it your own?